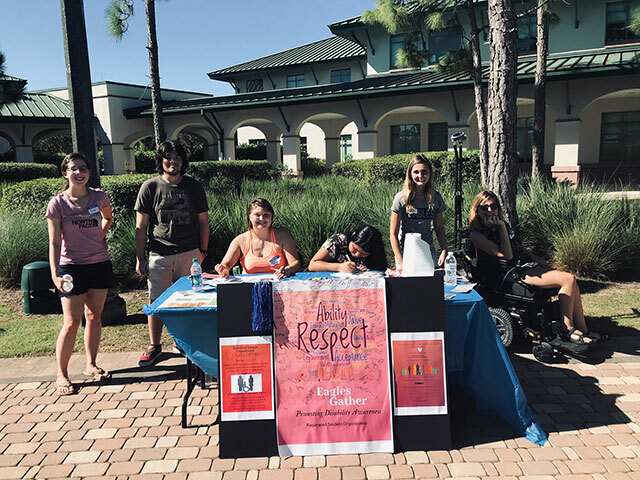 Inclusion is a hallmark of every registered student organization at Florida Gulf Coast University, and that acceptance can sometimes work in different ways. For instance, members of Eagles Gather, an advocacy group for disabled students, welcomes everyone with open arms — even those who aren’t disabled. In fact, this RSO considers targeting and educating the non-disabled community a major part of its mission. “It provides disabled students with opportunities to engage in valuable learning outside the classroom that promotes inclusion, enhances their college experience and cultivates a stronger sense of community,” she said. Members of Eagles Gather spread the word about their organization. / Photos courtesy of John Wargo Jr.
Eagles Gather originally was formed in fall 2015 but quickly faded when its founding students graduated. Rejuvenated by Cockrell-Black and a new group of energetic student leaders, including president Mireya Hernandez Cruz, the all-new Eagles Gather already has 30 active members and continues to grow. “These are goal-oriented students of substance who have a sincere desire to spread disability awareness,” said Wargo, who graduated from Gulf Coast High School in Collier County. “I wanted to be part of that effort — to erase the stigma attached to the word ‘handicapped,’ and help these individuals prove that a disability does not disqualify them from success. FGCU has an abundance of resources to ensure appropriate accommodations are available to those who need them. They are a right, not special treatment. “It is my hope that others will gather with us to find the comfort, camaraderie and future service opportunities that come with being a member of Eagles Gather,” he said. Wargo’s endorsement is enthusiastic, and it should be, considering he’s the RSO’s media marketing manager. With that introduction, we give the rest of this story to him, to tell in his own words. Navigating the halls of academia can be a daunting challenge for any individual, but the obstacles can be much greater for an individual with a disability. But we at Eagles Gather are here to prove that a disability does not mean we are disqualified from any sort of post-secondary education. With the right resources and support from each other and the different offices on campus, we elevate the student to a higher level of well-being and success. We believe there is an incredibly underrepresented population on campus of students with disabilities. There are untold numbers of hardships an individual may be trying to overcome. Eagles Gather is a safe place for students (with or without a documented disability) to come together as one. We support one another. We know those challenges. We understand the frustrations. Most importantly, we don’t quit. This incredible RSO will give anyone who joins a “home away from home” where he or she may speak his or her mind about individual difficulties they may be facing, share in their triumphs, and find a sense of community involvement on campus without feeling defeated or left out. While we are in the infant stages of formation, we are already 30 members strong in less than one semester. We have secured a small budget from Student Government, for which we are incredibly grateful. There are no limits to how big this organization can grow, and it is our vision that this RSO will be solidified and strong upon our graduation so that future Eagles can find safety and comfort with their fellows. Our meetings will be posted on EagleLink at least two weeks in advance and we invite all students to follow us on Instagram and friend us on Facebook to keep up on all the exciting adventures we set out to explore. We look forward to welcoming anyone interested in joining us in this meaningful cause. Besides the Eagles Gather social-media and web links, anyone interested can email Eagles Gather or Zabrina Cockrell-Black.